For other uses, see Vespers (disambiguation). Vespers is a sunset evening prayer service in the Orthodox, Roman Catholic and Eastern Catholic, Anglican, and Lutheran liturgies of the canonical hours. The word comes from the Greek ἑσπέρα ("hespera") and the Latin vesper, meaning "evening". It is also referred to in the Anglican tradition as evening prayer or evensong. The term is also used in some Protestant denominations (such as the Presbyterian Church and Seventh-day Adventists) to describe evening services. Vespers, also called Evening Prayer, takes place as dusk begins to fall. Evening Prayer gives thanks for the day just past and makes an evening sacrifice of praise to God (Psalm 141:1). 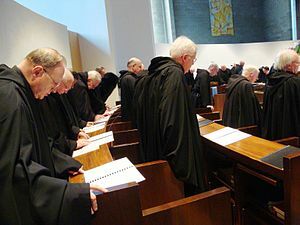 The appointed psalmody is then sung: in the liturgy in general use since 1970 there are two psalms and a New Testament canticle, while in the older form of the Roman Rite, five psalms are sung instead. Each psalm (and canticle) concludes with a doxology (Gloria Patri) and is preceded and followed by an antiphon. Additionally, most Psalms also have a short caption explaining how the Psalm/Canticle relates to the Church in a Christological or spiritual way; lastly, English translations oftentimes have a psalm-prayer said after the Gloria and before the antiphon. Then the participants sing the Magnificat — the canticle of the Blessed Virgin Mary from the Gospel of Luke 1:46-55. The Magnificat is always preceded by an antiphon, and followed by the Gloria and an antiphon. At Solemn Vespers, the Altar is incensed during the Magnificat. The preces (intercessory prayers) are then said (in the post-1970 Roman Rite), followed by the Our Father, and then the closing prayer (oratio) and final blessing/invocation. The Byzantine Rite has three basic types of vespers: great, daily, and small. Great vespers is used on Sundays and major feast days (those when the Polyeleos is prescribed at matins) when it may be celebrated alone or as part of an All-Night Vigil, as well as on a handful of special days e.g., Good Friday and Pascha afternoon; on certain days of strict fasting it also commences the divine liturgy. Daily vespers is otherwise used. Small vespers is a very abbreviated form used only on the afternoon before a vigil and is redundant to the subsequent great vespers, being a place holder betwixt the ninth hour and compline and is seldom used except in monasteries where the vigil literally lasts all night. Since the liturgical day begins at sunset, vespers is a day's first service and its hymns introduce the day's themes. Vespers opens with a blessing by the priest and then "Come, let us worship ..."; when part of an All-Night Vigil, the blessing that normally begins matins is used; when part of the Divine Liturgy, the blessing that is part thereof is used. Proemial Psalm (Psalm 103 (104)): "Bless the Lord, O my soul; O Lord my God, Thou hast been magnified exceedingly...". A selection of psalms, called a kathisma is sung. On Saturday evening, it is the First Kathisma (Psalms 1-8). "Lord I have Cried" (Psalms 140 (141), 141 (142), 129 (130), and 116 (117)) is chanted in the tone of the week. Starting with the last two verses of Psalm 141 (142), stichera (stanzas) about the feast day (or Christ's resurrection on a Saturday evening) are chanted alternately with the verses. The hymn Phos Hilaron ("O Gladsome Light") is sung. On feast days, there are three or more readings from the Old Testament, called Paroemia ("Parables"). The prayer "Vouchsafe, O Lord", is read. On major feast days, a Litiy will be served at this point. The clergy and the cantors will process to the back of the church in front of an icon of the feast or saint being commemorated. After the cantors chant hymns pertaining to the feast, the deacon or priest will read a litany with several long peititions, to which the cantors respond with Kyrie eleison ("Lord, Have Mercy") many times. The priest ends with a long prayer invoking the intercessions of the saints and the Theotokos. The Aposticha are chanted. These are verses that teach about the feast day (or on a Saturday evening, Christ's resurrection). The Nunc dimittis, the Canticle of St. Simeon ("Lord, now lettest Thou Thy servant depart in peace...") (Luke 2:29-32), is read. The Apolytikia (troparia of the day) are chanted. If it is an All-Night Vigil on Saturday night, the hymn "Rejoice, O Virgin Theotokos" is chanted instead. On major feast days, the artoklasia is performed, at which the priest will bless five loaves of bread which have been prepared in the center of the church, together with wheat, wine and oil. These will be distributed to the faithful later in the service (if it is an All-Night Vigil). Then Psalm 33 (34) is read up to the verse "O fear the Lord, all ye his saints; for there is no want to them that fear him." The next verse "Rich men have turned poor and gone hungry, but they that seek the Lord shall not be deprived of any good thing" is chanted. The dismissal is given by the priest. If it is an All-Night Vigil this is a simple blessing by the priest; otherwise, it is the full dismissal sequence. On strict fast days when food and drink are prohibited before vespers, e.g., Christmas Eve, the Annunciation when it falls on a weekday of great lent, or Holy Saturday, Vespers is joined to the Divine Liturgy, functioning in place of the typica as the framework of the hymns of the Liturgy of the Catechumens. After the readings from the Old Testament, the Trisagion is chanted, followed by the Epistle and Gospel, and the Divine Liturgy proceeds normally from that point. On these occasions, as at other times when the Gospel is read at vespers, the Little Entrance is made with the Gospel Book instead of the censer. The Liturgy of the Presanctified Gifts always is similarly combined with Vespers, with the first half of Vespers (up to and including the Old Testament readings) making up a significant portion of the service. Vespers is the only service in the Armenian daily office other than the Morning Service which has hymns proper to the commemoration, feast, or tone assigned to it: a vespers hymn after Psalm 142 (or after Gladsome Light if it is appointed for the day) and the “Lifting-up Hymn” after Psalm 121. Vespers undergoes a wide range of changes depending on the liturgical season. The following outline contains only some of these variations. Vespers are known by the Aramaic or Syriac term Ramsha in the East Syriac liturgy which was used historically in the Church of the East and remains in use in Churches descend from it, namely the Assyrian Church of the East, the Ancient Church of the East, the Chaldean Catholic Church, and the Syro-Malabar Catholic Church. In some Oriental Orthodox churches, Vespers is called the Raising of Incense. Vespers is an introduction and preparation for the Liturgy, consisting of a collection of prayers, praises and Thanksgiving prayers which request the Lord's blessings upon the sacramental service. This is true for the Coptic Orthodox Church; use of the term and order of services are somewhat different in the Ethiopian, Syriac, and the other Oriental Orthodox Churches. The Thanksgiving Prayer - As with all Coptic Orthodox services, Vespers first thanks God "for everything, concerning everything, and in everything"
Since its inception, the Anglican communion has maintained an evening office, which is called evening prayer (or evensong). There are prescribed forms of the service in the Anglican prayer book. A similar form of the service is found in the Vespers section of The Lutheran Hymnal. The Anglican breviary contains Vespers in English according to the pre-1970 Roman rite. For information on that service, see above, as in the Roman breviary. The Liberal Catholic Rite also includes Vespers, including the Te Deum as an alternative to the Magnificat. Daily office books that conform to the historic structure of Vespers have also been published by the Pilgrim Press (The New Century Psalter) and Westminster John Knox Press (Book of Common Worship Daily Prayer). Both publishing houses are affiliated with churches in the Reformed tradition. From its traditional usage, the term vespers has come to be used more broadly for various evening services of other churches, some of which model their evening services on the traditional Roman Catholic form. Presbyterians and Methodists, as well as congregationalist religious bodies such as Unitarian Universalism, often include congregational singing, readings, and a period of silent meditation, contemplation, or prayer. Some regular community vespers services are completely areligious (or at least are not sponsored by any church) and serve simply as a time for quiet contemplation in the evening hours. In addition, during the 19th and early 20th centuries, synagogues in the Classical Reform tradition sometimes referred to their Friday evening worship services as "vespers". Nowadays, such services are instead called kabbalat shabbat, which means "welcoming the Sabbath". This section incorporates information from the Catholic Encyclopedia of 1917. References to psalms follow the numbering system of the Septuagint, and said in the Latin of the Vulgate. Before the fourth century allusions to the evening prayer are found in the earlier Fathers, Clement I of Rome (Clemens Romanus), St. Ignatius, Clement of Alexandria, Tertullian, Origen, the Canons of St. Hippolytus, St. Cyprian. Pliny the Younger, in his famous letter at the beginning of the 2nd century, speaks of liturgical reunions of the Christians in the morning and in the evening: "coetus antelucani et vespertini". Vespers is, therefore, together with Vigil, the most ancient Office known in the Church. The Rule of St. Benedict was written about 530-43. Much earlier than this we find an evening Office corresponding to both that of Vespers and that of Compline. Its name varies. John Cassian calls it Vespertina synaxis, or Vespertina solemnitas. Benedict used the name vespera which has prevailed, whence the French word vêpres and the English vespers. The name, however, by which it was most widely known during that period was Lucernalis or Lucernaria hora. It was so called because at this hour candles were lit, not only to give light, but also for symbolical purposes. The "Peregrinatio", the date of which is probably the 4th century, gives the liturgical order as practised at Jerusalem. The author states that this Office took place at the tenth hour (four o'clock in the evening); it is really the Office des lumières, i.e. of the lights; it was celebrated in the Church of the Holy Sepulchre; all the lamps and torches of the church were lighted, making, as the author says, "an infinite light". In the "Antiphonary of Bangor", an Irish document of the 6th century, Vespers are called hora duodecima, which corresponds to six o'clock in the evening, or hora incensi, or again ad cereum benedicendum. All these names are interesting to note. The hora incensi recalls the custom of burning incense at this hour, while at the same time the candles were lighted. The ceremony of the lights at Vespers was symbolic and very solemn. Vespers, then, was the most solemn office of the day and was composed of the psalms called Lucernales (Psalm 140 is called psalmus lucernalis by the Apostolic Constitutions). Cassian describes this Office as it was celebrated by the monks of Egypt and says they recited twelve psalms as at the vigil (matins). Then two lessons were read as at vigils, one from the Old, and the other from the New Testament. Each psalm was followed by a short prayer. Cassian says the Office was recited towards five or six o'clock and that all the lights were lit. The use of incense, candles, and other lights would seem to suggest the Jewish rites which accompanied the evening sacrifice (Exodus 29:39; Numbers 28:4; Psalm 140:2; Daniel 9:21; 1 Chronicles 23:30). It may thus be seen that the Lucernarium was, together with Vigil, the most important part of the Offices of the day, being composed of almost the same elements as the latter, at least in certain regions. Its existence in the fourth century is also confirmed by St. Augustine, St. Ambrose, St. Basil, St. Ephraem, and, a little later, by several councils in Gaul and Spain, and by the various monastic rules. In the sixth century the Office of Vespers in the Latin Church was almost the same as it has been throughout the Middle Ages and up to the present day. In a document of unquestionable authority of that period the Office is described as follows: The evening hour, or vespertina synaxis, is composed of four psalms, a capitulum, a response, a hymn, a versicle, a canticle from the Gospel, litany (Kyrie eleison, Christe eleison), Pater with the ordinary finale, oratio, or prayer, and dismissal (Regula Sancti Benedicti, xvii). The psalms recited are taken from the series of psalms from Pss. 109 to 147 (with the exception of the groups 117 to 127 and 133 to 142); Pss. 138, 143, 144 are each divided into two portions, whilst the Pss. 115 and 116 are united to form one. This disposition is almost the same as that of the "Ordo Romanus", except that the number of psalms recited is five instead of four. They are taken, however, from the series 109 to 147. Here, too, we find the capitulum, versicle, and canticle of the "Magnificat". The hymn is a more recent introduction in the Roman Vespers; the finale (litanies, Pater, versicles, prayers) seems all to have existed from this epoch as in the Benedictine cursus. Like the other hours, therefore, Vespers is divided into two parts; the psalmody, or singing of the psalms, forming the first part, and the capitulum and formulæ the second. Vesper time varied according to the season between the tenth hour (4 p.m.) and the twelfth (6 p.m.). As a matter of fact it was no longer the evening hour, but the sunset hour, so that it was celebrated before the day had departed and consequently before there was any necessity for artificial light (Regula S. Benedicti, xli). This is a point to be noted, as it was an innovation. Before this epoch this evening synaxis was celebrated with all the torches alight. The reason of this is that St Benedict introduced in the cursus, another hour—that of Compline—which was prescribed to be celebrated in the evening, and which might be considered as a kind of doubling of the Office of Lucernarium. As has already been remarked, the institution of the office of compline transformed the lucernarium by taking from it something of its importance and symbolism, the latter at the same time losing its original sense. St. Benedict called it only Vespera, the name which has prevailed over that of lucernarium (cf. Ducange, "Glossarium med. et inf. lat. ", s.v. Vesperae). The Gallican liturgy, the Mozarabic Liturgy, and, to a certain extent, the Milanese, have preserved the lucernarium (cf. Bäumer-Biron, l. c., 358). The Eastern Orthodox Church retains the "Lumen hilare" and some other traces of the ancient lucernarium in the offices of vespers and compline (cf. Smith, "Dict. Christ. Antiq. ", s.v. Office, Divine). In the Rule of St. Columbanus, dated about 590, Vespers still has twelve psalms, amongst which are Pss. cxii and cxiii, the Gradual psalms, Pss. cxix sqq. (cf. Gougaud, "Les chrétientés celtiques", 309; "Dict. d'arch. chrét. et de liturgie", s.v. Celtique, 3015). The "Antiphonary of Bangor", a document of Irish origin, gives for vespers Ps. cxii and also the "Gloria in Excelsis". For modifications since the 12th century, cf. Bäumer-Biron, l. c., II, 54 sqq. The decree "Divino afflatu" (November 1, 1911) involves important changes in the old Roman Rite office. There is an entire rearrangement of the psalms (see Reform of the Roman Breviary by Pope Pius X) with new ones appointed for each day of the week. These psalms are to be recited with their antiphons, not only at the Office de tempore (Sundays and feriæ) but also on feasts of a lesser rite than doubles of the second class, that is to say, on simples, semidoubles (double minors), and double majors. On feasts which are doubles of the second class and a fortiori of the first class, as well as on feasts of the Blessed Virgin Mary, the Holy Angels, and Apostles, the psalms are proper to the feast as heretofore. On all feasts, of whatever rite, the second part of vespers, that is, the capitulum, hymn, antiphon of the "Magnificat", is taken from the Sanctorale. On semi-doubles and those of a lesser rite the suffrages are now reduced to a single antiphon and orison which is common to all the saints heretofore commemorated, whilst the preces ("Miserere" and versicles) formerly imposed on the greater feriæ are now suppressed. Vespers begins with the singing or chanting of the opening versicles Deus, in adiutorium meum intende. Domine, ad adiuvandum me festina. Gloria Patri, et Filio, et Spiritui Sancto. Sicut erat in principio, et nunc et semper, et in saecula saeculorum. Amen. Alleluia. (O God, come to my assistance. O Lord, make haste to help me. Glory be to the Father, and to the Son, and to the Holy Spirit. As it was in the beginning, both now and ever, and unto ages of ages. Amen. Alleluia.) From Septuagesima until Easter, Laus tibi Domine, Rex aeternae gloriae (Praise be to Thee O Lord, King of eternal glory) replaces Alleluia. Five psalms are sung, each concluding with the doxology Gloria Patri. Each psalm is preceded and followed with an antiphon. The Little Chapter, a short biblical verse, is read. The hymn, which varies according to season and feast, is sung, followed by its versicle and response. The Magnificat, preceded and followed with an antiphon, is then sung. The preces are then said on certain greater ferias. The collect of the day is said, followed by commemorations of any concurring feasts according to the rubrics. If Compline does not immediately follow, Vespers may end with the seasonal Marian Antiphon. Notwithstanding the changes brought about in the course of time, Vespers still remains the great and important Office of the evening. As already pointed out, it recalls the sacrificium vespertinum of the Old Law. In the same manner as the night is consecrated to God by the Office of the Vigil, so also is the end of the day by Vespers. It terminates, as Matins formerly terminated, and Lauds at present terminates, by a lection, or reading, from the Gospel, or canticum evangelii, which, for Vespers, is always the "Magnificat". This is one of the characteristic traits of Vespers, one of the liturgical elements which this particular Office has retained in almost all regions and at all times. There are, however, a few exceptions, as in some liturgies the "Magnificat" is sung at Lauds (cf. Cabrol in "Dict. d'arch. et de liturgie", s.v. Cantiques évangéliques). This place of honour accorded so persistently to the canticle of Mary from such remote antiquity is but one of the many, and of the least striking, proofs of the devotion which has always been paid to the Blessed Virgin Mary in the Church. The psalms used at Vespers have been selected, from time immemorial, from Pss. cix to cxlvii, with the exception of Ps. cxviii, which on account of its unusual length does not square with the others, and is consequently ordinarily divided up into parts and recited at the little hours. Pss. i to cviii are consecrated to Matins and Lauds, whilst the three last psalms, cxlviii to cl, belong invariably to Lauds. The series of hymns consecrated to Vespers in the Roman Breviary also form a class apart and help to give us some hints as to the symbolism of this hour. The hymns are very ancient, dating probably, for the most part, from the 6th century. They have this particular characteristic—they are all devoted to the praise of one of the days of the Creation, according to the day of the week, thus: the first, "Lucis Creator optime", on Sunday, to the creation of light; the second, on Monday, to the separation of the earth and the waters; the third, on Tuesday, to the creation of the plants; the fourth, on Wednesday, to the creation of the sun and moon; the fifth, on Thursday, to the creation of the fish; the sixth, on Friday, to the creation of the beasts of the earth; Saturday is an exception, the hymn on that day being in honour of the Blessed Trinity, because of the Office of Sunday then commencing. The celebrant and assistants follow the acolytes into the church wearing the biretta. Upon arriving in the sanctuary the acolytes place their candles on the lowest altar step, after which they are extinguished. The celebrant and assistants kneel on the lowest step and recite the Aperi Domine silently, after which they go to their places and recite the Pater noster and Ave Maria silently. A curious practice which exists from ancient times is the intoning of the antiphons and psalms to the celebrant. The rubrics presuppose that the first assistant or cantors will intone all which the celebrant must sing by singing it to him first in a soft voice after which the celebrant sings it again aloud. The five antiphons and psalms are sung with the first assistant intoning the antiphons and the cantors intoning the psalms. During the singing of the psalms all sit. After the psalms, the acolytes relight their candles and carry them to each side of the lectern for the chapter. The assistants follow, standing facing each other in front of the lectern. The celebrant then sings the chapter, after which all return to their places. The first assistant intones the hymn to the celebrant, and all stand while the hymn is sung. The first assistant intones the Magnificat to the celebrant, who sings the first line aloud. The celebrant and the first two assistants go to altar, and the altar is then incensed as at Mass while the first two assistants hold the ends of the cope. Other altars in the church may be incensed as well. The first assistant then incenses the celebrant, after which the thurifer incenses the others as at Mass. If there are commemorations, the acolytes and assistants again go to the lectern as described above for the chapter. The choir sings the antiphons, the cantors sing the versicles, and the celebrant sings the collects. After all commemorations, the celebrant sings Dominus vobiscum, the cantor sings Benedicamus Domino, and the celebrant sings Fidelium animae.... The Marian antiphon is said in the low voice. Especially in English-speaking countries, Benediction of the Blessed Sacrament often follows Solemn Vespers. ^ "Home - Christ Church Cathedral Vancouver". Cathedral.vancouver.bc.ca. 2015-05-15. Retrieved 2015-05-22. ^ Keith Danby. "Welcome to Christ Church Deer Park - There's Life Here!". Christchurchdeerpark.org. Retrieved 2015-05-22. ^ "Vespers". Usccb.org. 2013-04-16. Retrieved 2015-05-22. ^ "The Spirituality of the Rites of the Holy Liturgy in the Coptic Orthodox Church by H.G. Bishop Mettaous". Tasbeha.org. Retrieved 2015-05-22. ^ a b c "Catholic Encyclopedia: Vespers". Newadvent.org. Retrieved 2015-05-22. Look up vespers in Wiktionary, the free dictionary. Wikimedia Commons has media related to Vespers.